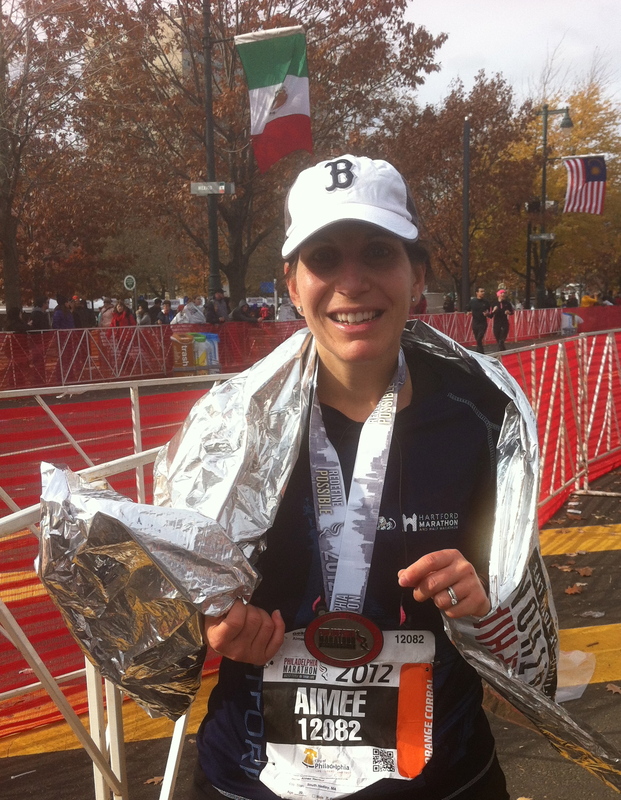 After training for the Hartford ING Half Marathon last October I admit that I felt a little burnt out from running. I had been running nonstop for months and even continued beyond the half marathon to prepare to beat my personal record for two 5Ks. Once the race season ended I stopped running so much. As the weather turned colder I began visiting the gym more frequently. I did cardio on the Arc Trainer or Treadmill, but I also I started incorporating strength training exercises two to three times a week. I stuck to the few machines I knew and I used 5lb and 10lb free weights to do a routine I knew from a while ago. I did sit ups and stretching as well. My body, once again shifted and changed in ways I had never seen it thanks to the strength training. I felt stronger and not as loose in certain areas. If you know what I mean! In the spring I ventured into a local yoga studio after years of wanting to try it. I took a beginners yoga class almost every Monday for about 6 weeks. I loved it. It challenged my body in ways that it had never been challenged before. Unfortunately once the little guy finished school I no longer had the open window of time in my schedule to attend class. While my husband would have gladly assumed childcare responsibilities there were no classes when he was home in the evenings. Besides the fact that my evenings are limited due to my work schedule. Yoga classes are a bit expensive on their own never mind having to pay someone to babysit Carlos. So I stopped going. I miss it though and hope to get back there soon. I love running. It fit into my busy schedule at a time when nothing else really would. It provided much needed “me” time, time to think, time to not think, time to be alone, time just for myself. Running has taught me to push beyond my limits. It has proven to me that I CAN be athletic and be committed to activity. However, as I look to the future, post-marathon, I am excited about new challenges, namely weight training and yoga. Running can be hard on the body over time. I don’t think that I will ever quit running but it might be nice to do it a little less. As I strive to achieve and maintain a healthy body weight I know that combining weight training and yoga with the running will be the most effective way for me to reach my goals. Taking a cue from Marion at Affection for Fitness, I did something yesterday that I probably never would have done. When I finished up on the Arc Trainer I noticed this group I’ve seen many times before doing bench presses. They work out together nearly everyday of the week. I walked over and introduced myself, then boldly asked if they could give me an instruction on the bench press. I may have caught the group off guard at first, but I persisted. One of the guys set up the bench next to theirs and gave me a demonstration. Before I knew it everyone was giving me tips and different members of the group served as spotters as I completed a few reps based on their suggestion. The group of two men and three women explained they have been strength training together for three years. They focus on different areas of the body each week day. Yesterday was back and chest. They all looked incredible and I was genuinely shocked by some of their ages. My gym is no frills, no trainers or classes. If I want to learn something then I must seek out the information or instruction. We are all there for the same purpose so I don’t feel funny asking people. The worse thing they can say is no. However, I know for sure that someday down the line when I look like I know what I’m doing and someone comes to me for instruction on how to bench press you better believe I will take the time to show them. Don’t be afraid to try something new. You never know what you are capable of until you try. ← Marathon Training Week 13 and an Award! I think it’s pretty awesome that you went up and asked them and that they gladly helped you out. I think I’m too shy to ever ask anyone at the gym anything, but maybe some day! I would love to start strength training, I always hear about the amazing benefits people get from doing it. I really need to add strength training to my routine – it does change the shape of your body even if the scale doesn’t show it. Hi Aimee! Super post! There is so much good wisdom and advice in it that I wish people would do! Don’t you think it’s life-changing to become a person receptive to help and advice? I improved so much and so fast when I started listening to what others have to say about fitness. You learned how to bench press and now have a small group of gym buddies to ask next time you need a spotter to someone to check your form on a new weightlifting exercise. And I’m sure that you will pay it forward. Wow, good for you, Aimee!! I still feel like a fish out of water at the gym. I carefully watch other gym-goers in the free weights area and wish I had the confidence to go over and try it out!